As Tennyson's father grew older, he became more passionate and melancholy (sad). He began drinking heavily, suffered from lapses of memory, and once even tried to kill his eldest son. Misfortune, not surprisingly, haunted the whole Tennyson family. The year he died, the elder Tennyson said of his children, "They are all strangely brought up." Tennyson began writing poetry as a child. At twelve he wrote a six-thousand-line epic (a long poem about a real or fictional heroic figure) in imitation of Sir Walter Scott (1771–1832). Other models were Lord Byron (1788–1824), and Percy Bysshe Shelley (1792–1822). In 1827 there appeared a small volume entitled Poems by Two Brothers. The book, despite its title, included poems by three of the Tennyson brothers, a little less than half of them probably by Alfred. That same year he entered Trinity College, Cambridge University. Tennyson's undergraduate days were a time of intellectual and political turmoil in England. He belonged to a group called the Apostles. The institutions of church and state were being challenged, and the Apostles debated these issues. He also took up the cause of rebels in Spain. Those who knew Tennyson as a university student were impressed by his commanding physical presence and his youthful literary achievements. In 1831 his father died, and Tennyson left the university without taking a degree. In the volume entitled Poems, which Tennyson published in 1832, a recurring theme is the conflict between a selfish love of beauty and the obligation to serve society. The collection includes "The Lady of Shalott," a narrative set in the England of King Arthur (a mythical king of England). Tennyson was saddened by some of the reviews of this book and by the death of a close friend. For the next ten years he did not publish anything. In 1840 he invested what money he had inherited in a plan to make woodworking machinery. By 1843 he had lost his small inheritance. Poems, Two Volumes (1842) signaled a change in Tennyson's fortunes. It contained one of the several poems that would eventually make up the Idylls of the King. Other poems in this collection are "Ulysses," a dramatic monologue (speech given by one person) in which the aging king urges his companions to undertake a final heroic journey. In "The Two Voices" he wrote of an interior debate between the wish to die and the will to live. Poems, Two Volumes was well received. The prime minister (head of government) of England, who was particularly impressed by "Ulysses," awarded Tennyson a pension (a fixed annual amount of money) that guaranteed him two hundred pounds a year. The greatest year of Tennyson's life was 1850. On June 1 he published In Memoriam, the long elegy (an artistic piece expressing sadness over someone's death) inspired by the death of his friend Arthur Hallam. Less than two weeks later he married Emily Sellwood, with whom he had fallen in love fourteen years before. Finally, in November, he was appointed poet laureate (official poet of a country) to succeed William Wordsworth (1770–1850). Tennyson's years of uncertainty and financial insecurity were over. He became the highly regarded poetic spokesman of his age. In Memoriam is a series of 129 lyrics (short poems) of varying length, all composed in the same form. The lyrics may be read individually, rather like the entries in a journal, but the poem has an overall organization. It moves from grief through acceptance to joy. The poem combines private feeling with a confusion over the future of Christianity, which was a feeling many of Tennyson's age group shared. Although Tennyson was now settled and prosperous, his next book, Maud and Other Poems (1855), is notable for another study in sadness. Tennyson described the poem as a "little Hamlet," a reference to the play written by William Shakespeare (1564–1616). It almost certainly expresses some of the author's youthful anxieties as recollected in his middle age. Of the other poems in the 1855 volume, the best-known are "The Charge of the Light Brigade" and "The Ode on the Death of the Duke of Wellington," perhaps the greatest of the poems written by Tennyson in his capacity as poet laureate. Between 1856 and 1876 Tennyson's principal concern was the composition of a series of narrative poems about King Arthur and the Round Table. He worked on this project for more than twenty years. One section was written as early as 1833. Another part was not published until 1884. As published in 1889, The Idylls of the King consisted of twelve blank-verse (unrhymed iambic pentameter [lines of five poetic feet]) narratives (the idylls) that dealt with Arthur, Merlin, Lancelot, Guinevere, and other figures in the court. The individual narratives are linked by a common theme: the destructive effect of incorrect passion on an honorable society. The Round Table is brought down in ruins by the unlawful love of Lancelot and Guinevere. Some of Tennyson's peers regretted that he had expended so much attention on the legendary past. However, it is clear that this poetic myth of a dying society expressed some of his fears for nineteenth-century England. Tennyson had a long and immensely productive literary career. A chronology (list of works by date) shows that he did ambitious work until late in his life. In his sixties he wrote a series of historical verse plays—"Queen Mary" (1875), "Harold" (1876), and "Becket"(1879)—on the "making of England." The plays were intended to revive a sense of national grandeur and to remind the English of their liberation from Roman Catholicism. Tennyson's last years were crowned with many honors. The widowed Queen Victoria (1819–1901) ranked In Memoriam next to the Bible as a comfort in her grief. In 1883 Tennyson was awarded a peerage (rights of nobility). 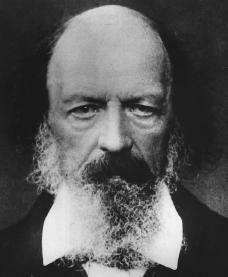 Tennyson died in Haslemere, England, on October 6, 1892. He was buried in Westminster Abbey after a great funeral. The choir sang a musical setting for "Crossing the Bar," Tennyson's poem that is placed at the end of all collections of his work. Bloom, Harold, ed. Tennyson. Broomall, PA: Chelsea House, 1999. Lang, Cecil Y., and Edgar F. Shannon, eds. The Letters of Alfred Lord Tennyson. New York: Oxford University Press, 1981. Ricks, Christopher. Tennyson. 2nd ed. Berkeley: University of California Press, 1989. Shaw, W. David. Alfred Lord Tennyson: The Poet in an Age of Theory. New York: Twayne, 1996. Tennyson, Hallam. Alfred, Lord Tennyson: A Memoir. New York: Macmillan, 1897. Reprint, Boston: Milford House, 1973.